It is only logical that you would want to have the mattresses in your home in a perfect condition at all times, no matter what. This is precisely what we are offering to make happen for you here. We have tailored a premier quality, highly reliable and fully certified professional mattress cleaning service in Knightsbridge that is perfect for both residents of the area and establishments (hotels, hostels, hospitals etc). During the long time since we have started providing our top notch sanitation services around here, we have had the chance to work for thousands of people, all of who have been left highly satisfied by the quality of the job we have managed to do. You want the place where you spend most of your time when you are at home (the bed, of course) to be clean, hygienic and free of allergens. Like the rest of the sanitation services that are being delivered by our company, the Knightsbridge mattress cleaning that we bring to your attention here is handled by a team of very responsible, highly capable and fully licensed professional cleaners who know how to get the most out of every situation. Our technicians operate on a very flexible schedule that is considered in accordance to your needs and own personal preferences. 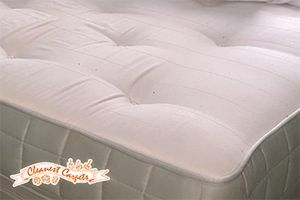 On top of this, they use state of the art steam cleaning machines that enable them to achieve optimal results in removing stains, soiling, dirt, dust and allergens from deep in your mattresses without bringing in any dangerous chemicals into your household. In case you would like to receive further details on our services, or our excellent schedule and competitive prices, please do not think twice about getting in touch with our friendly and very helpful around the clock customer support. Our experts can be reached both over the phone and via the easy to use online contact form that is to be found on our website. Booking can be made for any day of the week, and weekend and bank holiday operations are on the table. Just get in touch and let us arrange the rest for you.